Stop spam and ensure secure email exchange via the cloud. Get superior, cloud-based protection from inbound and outbound threats – including spam, phishing, zombie attacks and malware – while minimising deployment, administration and bandwidth expenses. Stamp out phishing, zombie and virus attacks and put an end to compliance violations with SonicWALL™ Hosted Email Security. Experience multi-layer, anti-virus threat protection, including SonicWALL Global Response Intelligent Defense (GRID)™, McAfee®, Kaspersky™, Cyren and SonicWALL Time-Zero virus protection, that is more effective than services that rely on a single anti-virus technology. Prevent confidential data leaks and regulatory violations with advanced compliance scanning and management. Add optional email encryption service to ensure the secure exchange of email containing sensitive customer data or confidential information. Trust fast-to-deploy and easy-to-administer hosted services to protect you from inbound and outbound email threats. Get predictable, cost-effective monthly or annual subscription rates with no upfront costs. Leverage multiple, patented protection techniques of hosted email security to stop spam and email attacks. Check email sender IP reputations as well as the reputation of content, structure, links, images and attachments. Protect against directory harvest attacks (DHAs) and denial of service (DoS) attacks and ensure sender validation. Uncover new threats and hidden known threats with a Support Vector Machine (SVM) algorithm, adversarial Bayesian filtering, image analysis and gibberish detection. Identify spoofed mail and reduce spam and phishing attacks with powerful Domain-based Message Authentication, Reporting and Conformance (DMARC) email authentication technology. Get reports on sources and senders of email, so you can detect and shut down unauthorised senders falsifying email with your address. Receive real-time threat updates from the SonicWALL GRID network and ensure delivery of good email. The GRID network collects and analyses information from industry threat lists, performs rigorous testing and evaluation of millions of emails every day, and establishes reputation scores for senders and content, identifying new threats as they occur. Ensure your anti-spyware and anti-virus security is up to date, with SonicWALL GRID Anti-Virus™ and premium anti-virus signatures from industry partners, such as McAfee, Kaspersky and Cyren. Safeguard your network from the time a new virus outbreak occurs until the time an anti-virus signature update is available, with the predictive technology of SonicWALL Time-Zero virus protection. Comply with regulatory mandates using advanced compliance scanning, management and, optionally, email encryption to prevent confidential data leaks and regulatory violations, and to ensure the secure exchange of sensitive data. Configure policies at the organisational level to scan outbound email content and attachments for sensitive data and route email for approval, archiving or encryption. Track encrypted email to confirm time of receipt and time opened. The recipient receives a notification email with easy instructions to log into a secure portal to read or securely download the email. No additional client software is necessary and, unlike competitive solutions, the encrypted email may be accessed and read from mobile devices and laptops. Preserve your network bandwidth, while enabling reliable, consistent email traffic. Block spam and viruses in the cloud and help ensure that only safe email is delivered to your mail infrastructure. Spool your filtered email messages if email servers are unavailable and deliver them when the servers are up. Eliminate the need for IT staff having to install software or hardware on premises, with hosted email security. Reduce the costs of upfront deployment as well as ongoing administration. Delegate spam management to end users and give them the freedom to personalise the aggressiveness of their spam-detection settings, while IT continues to control the overall level of security enforcement. 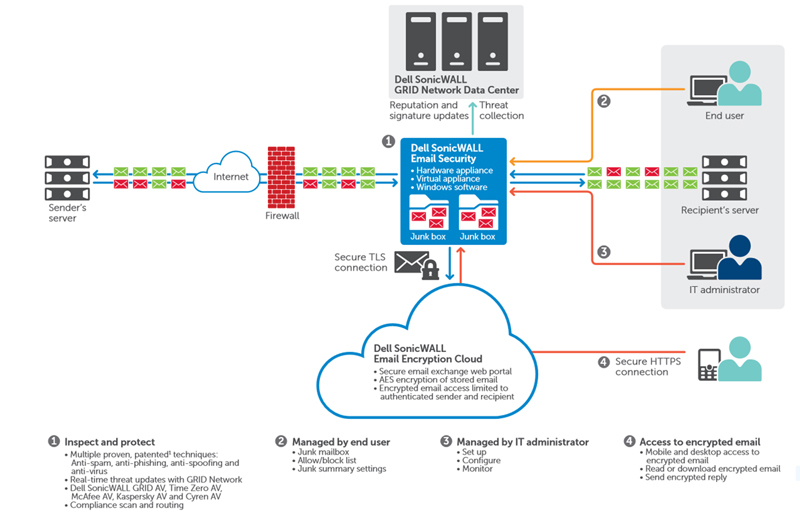 Simplify operations for managed service providers, with SonicWALL Hosted Email Security’s central account management for multiple subscribers, flexible purchase options and automated provisioning. Easily customise granular or system-wide reports and charts on threats, compliance, policy, connection management and more, with the customisable, drag and drop dashboard. Automatically generate reports as required.